It appears that Big Ben and his merry band of brothers' Super Bowl celebration in Vegas went off with no hitches on Friday night, which bucks the trend of other recent Steeler-related bar promotions. That's a good thing. 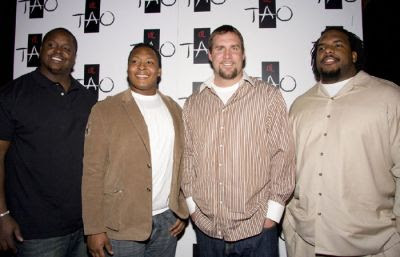 The big guy happily posed with Trai Essex, Darnell Stapleton and Willie Colon, a trio of linemen who hopefully prevented anyone from tackling Roethlisberger on Friday night. Newly-signed lineman Chris Kemoeatu was not in attendance, presumably because he was home counting all his money, which takes longer than you'd imagine. And center Justin Hartwig was probably busy thanking his lucky stars that Jeff Saturday decided to stay in Indianapolis. But all in all, it looks like the Super Bowl 43 champions were having some good clean fun...at least from these pictures.